The way the sound is shaped as it passes through the pipe of an organ is the result of a carefully calculated and intricate pipe design. Browsing through the Model Gallery, I came across a model of an organ pipe, and it happens to be a great acoustics tutorial for using the Pipe Acoustics, Frequency Domain interface in COMSOL Multiphysics. Let’s talk organ pipe design, and walk through how we can model it with multiphysics software. Pipe organs create musical notes as a result of air being pushed through the pipes in a deliberate fashion. In addition to the pipes, every organ needs a component to force the air through, and a way of directing the air so the correct pipes are played. Each pipe can only play one note, which is determined by all of the structure’s elements. When it comes to getting a clear sound with great resonance, the pipe’s structural design needs to be finely tuned. In acoustics, pitch occupies a very precise mathematical space. If the sound shifts from the intended note, it will come through in the music and may degrade the sound quality. You can model and optimize the design of an organ pipe using COMSOL Multiphysics along with the Pipe Flow Module and Acoustics Module. It is helpful to be able to model an organ pipe before its fabrication and to plan for all of the specific parameters that come together to create great sound. Sketch of an organ pipe including the mouth and the pipe body. In the organ pipe design model in our Model Gallery, all of the parameters of a working organ pipe are depicted. The organ pipe walls require elastic qualities in order to be modeled correctly, enabling them to vibrate when sound is propagating through them. Different wall properties slightly alter the perceived speed of sound in the pipes. The pipe in this particular model works at 440 Hz to produce the note A4 (or a’). The air flows in through the bottom of the pipe, up along the body, and out through the top where the mouth is. The mouth of the organ pipe has a carefully designed upper lip system, where the turbulence at the outlet initiates vibrations. The vibrating pipe body causes the pipe’s note to sound. The fundamental tone of the note corresponds to a half wave resonance in the pipe. Resonances of shorter wavelength generate harmonics of the fundamental frequency. All of the harmonics combined with the fundamental tone determine the exact pitch of the organ pipe. 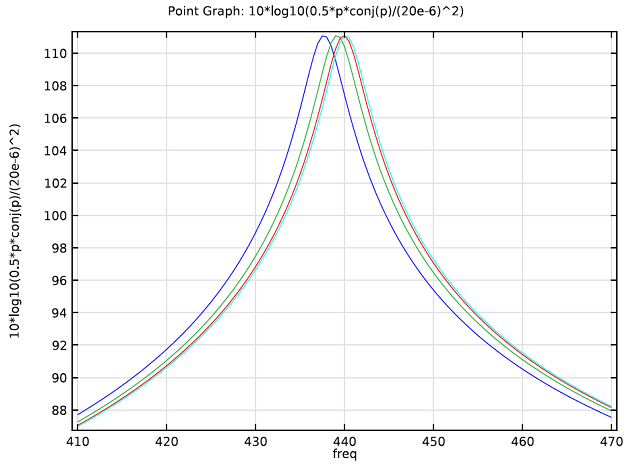 Resonance peak of the fundamental frequency at 440 Hz for different inner pipe radii. 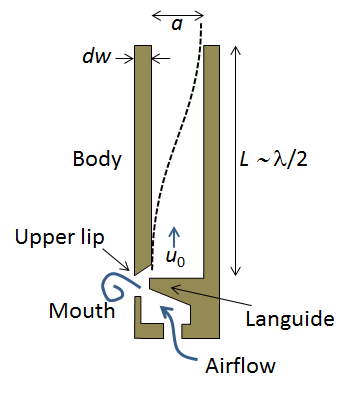 Any slight change in the parameters (such as pipe radius, shown above) will result in changes in the damping (the acoustic impedance at the open end of the pipe will change) and thus change the Q value of the frequency response resonance peaks of the organ pipe. This will then create a different pitch. The acoustic properties of the system can easily be studied with respect to other parameters, such as the pipe cross section shape, the pipe material, or the steady flow of air in the pipe. For example, a slight residual airflow u0 in the pipe could slightly change the resonance frequency. The pipe geometry for this particular model is defined with length L, inner pipe radius a, wall thickness dw, and a circular cross section shape. Changing the width of the pipe wall will slightly change the resonance, as shown in the following graph. The resonance changes because the elastic properties of the pipe wall determine how compressible a certain cross section is. The width of the pipe wall impacts the speed of sound in the pipe, which causes the resonance to change as well. 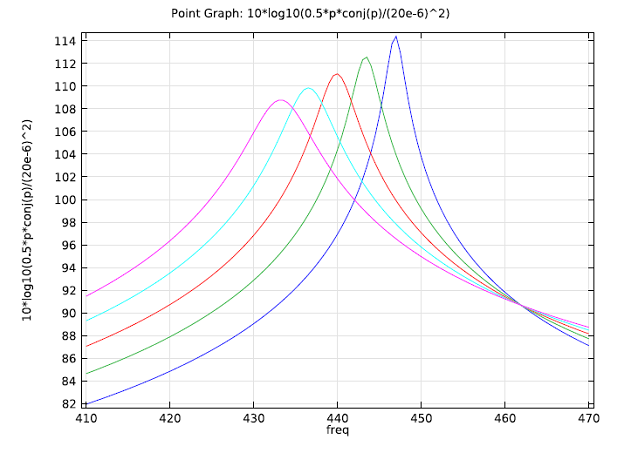 Resonance peak of the fundamental frequency at 440 Hz for different pipe wall thickness. As designers tweak and alter the materials and exact parameters of the organ pipe design, they are able to improve the sound of the instrument. The technology behind acoustics and pipe design has improved vastly over the years, and the sound quality continues to become more crisp and powerful. 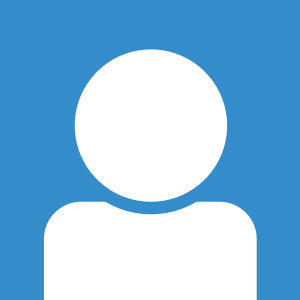 The tools that instrument designers have at their disposal are also always improving.